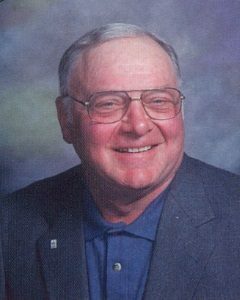 Larry Ondrachek, age 80, of Glencoe, Minnesota, passed away Wednesday, January 30, 2019, at his home in Glencoe, Minnesota. Memorial Service will be held Friday, February 8, 2019, 11:00 A.M. at Faith Presbyterian Church in Silver Lake, Minnesota, with interment at a later date. Gathering of Family & Friends will be held Friday, February 8, 2019, from 10:00-11:00 A.M., one hour prior the service. Memorials preferred to Faith Presbyterian Church in Silver Lake, Minnesota. Larry Theodore Ondrachek was born on December 5th, 1938, in the Glencoe Hospital, McLeod County, Minnesota. He was the second son and the second child of Theodore and Elizabeth Libby (Wondra) Ondrachek. Larry spent his youth on the family farm in Rich Valley Township. He was baptized at the Czech Brethren Presbyterian Church in Silver Lake, and confirmed in 1952. Larry attended District 12 Country School and graduated from Hutchinson High School in 1957. He studied Agriculture at the University of Minnesota, St. Paul campus. Larry joined the United States Army in January 1962. He served his country at Fort Carson, Colorado Springs, Colorado. He was honorably discharged in December 1963. After his discharge from the service he returned to Hutchinson and was employed by 3M from October 1965 until his retirement in August 1996. During his employment at 3M he also helped his father operate the family farm. Later, Larry assumed operation of the 80 acre farm, located in Rich Valley Township. This farm was originally homesteaded by Larry’s grandparents, Joseph Ondracek Sr. and Antonia (Beneš) Ondracek, who immigrated to America from Czechoslovakia. Larry had an appreciation for his family heritage. Countless hours were spent reminiscing about the previous generations. Pictures collected, stories told, Larry wanted it documented correctly. He had a genuine interest in the way things used to be done and this was evident in the way he preserved the original homes on his farm. He kept his home, yard, and buildings in pristine order which speaks to his character and to the honor of those who came before him. Larry was a lifelong member of the Czech Brethren, renamed Faith Presbyterian Church. He faithfully served as Elder, Trustee, Deacon, and Usher. Through the years he served on almost every committee, lending a hand in whatever way he could. Pastors appreciated Larry’s knowledge of the members as he accompanied them on many visits to shut-ins, sharing communion and good conversation. In the early morning hours of January 30th, Larry was in his home when it caught fire and was completely destroyed. He perished in the blaze. Larry leaves behind family members and friends to mourn his passing. Larry was preceded in death by his grandparents, Joseph Sr. and Antonia Ondracek; his parents, Theodore and Libby Ondrachek; an infant brother; and younger brother, Orville Ondrachek. In 2 Corinthians 1:3 Paul speaks to God's goodness and comfort: "Blessed be the God and Father of our Lord Jesus Christ, the Father of mercies and God of all comfort..." May those words bring comfort to us all. Worked with Larry years ago at 3M what a nice and fun person to be around and to work with. Our sympathies. We were gone on vacation and missed his service. I knew Larry from church, 3M, and the Legion. Great guy!